Hevenu Shalom Aleichem is such a popular Hebrew song that it's sung all over the world. During the past few months we've shared videos of it being performed in Indonesia, by Mayan children in Guatemala, and in a Korean musical stage show. 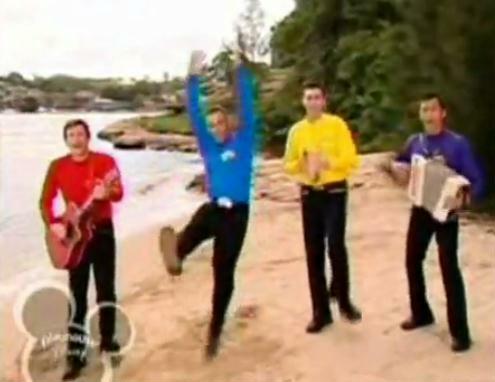 The Wiggles, a popular children's entertainment group that started out in Australia 20 years ago, and has been performing worldwide since then, recorded Hevenu Shalom Aleichem and included this video as part of their large collection of CDs and DVDs. The Wiggles' music, television, video and film that have proven to be modern classics. They have always been a touring band, which in part explains the success they have enjoyed. They have kept in constant contact with their public and the public has responded to the music and characters they have created. The Wiggles is an Australian success story that cuts across all demographics, and has now to spread across the world stage. The Wiggles self-titled first album/DVD was released in 1991 and 18 years and 27 VIDEO/DVD releases later, they have been awarded with 17 Gold, 12 Platinum, 3 Double Platinum and 10 Multi Platinum Awards for sales of over 23 million DVDs and 7 Million CDs worldwide. They have also been awarded with Highest Selling Children’s Video Sales in 1995, 1996, 1998, 1999, 2000, 2001, 2006 and 2007 at the AVSDA Awards. As songwriters and recording artists, The Wiggles have also been recognised by their peers, winning three prestigious APRA song writing awards for Best Children’s Song of 1994, 1995, 1996 and 2007 as well as each being awarded the prestigious International Award for their success overseas.